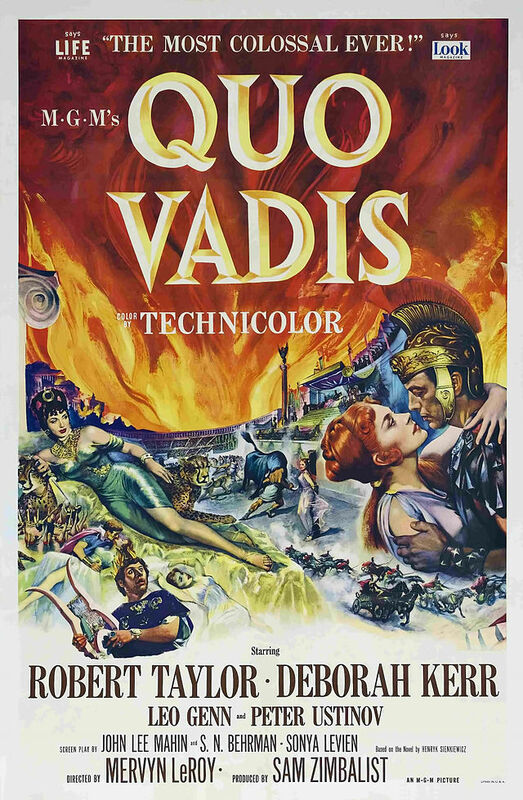 That being said, 1951’s mostly-fictional quasi-epic Quo Vadis is a member of this (maybe) exclusive club for good reason: the movie, good enough; the acting, fair-to-good; the plot, trite, but enjoyable; the overall quality of the film (objectively, of course), mildly entertaining to did-the-editors-go-on-strike? What I’m starting to see over a large enough sample size are patterns starting to emerge: nominations and wins seem to be largely epochal, longer films seem to take precedence, perhaps seen as of higher quality and, as technology becomes more refined, so does The Academy’s attention. Quo Vadis is no exception. On a subjective Likert scale, Quo Vadis rustles little feathers and might qualify somewhere in the average range in almost every category. Sometimes this formula steals an Oscar nomination and sometimes it pilfers a win (largely, in part, due to overall quality of the year) but most times the movie is forgotten quite quickly as “adquate.” Quo Vadis is no exception. The offensiveness of calling a Christian allusion to title the devilry of moving pictures is somewhat diminished by the double entendre in context. “Quo Vadis?,” in Latin, literally means “Where are you going?” as in, “I feel like I need to know this for some reason.” In Christian tradition, “Quo Vadis?” is more moralistic than it is literal, as is the biblical way: Saint Peter is fleeing probable (definite) crucifixion in Rome and loses courage and conviction, as Jesus arrives, risen, headed in the opposite direction, towards Rome. Saint Peter asks, “Quo Vadis?” as if seeing zombie Jesus wasn’t enough to get him to continue fleeing, to which Jesus, risen, responds, “Romam vado iterum crucifigi,” which, as we know, in English means, “I am going to Rome to be crucified again,” thereby through some zombie-transitive property fortifying Peter’s ministerial convictions. He eventually returns to Rome to be crucified upside-down, feeling that he does not deserve Jesus’ pre-risen fate in the same manner. The symbolism is many, ephemeral and highly allusive and, again, beyond the scope of this blog, save for its relation to Quo Vadis, the upside-down cross of post-WWII epic films. Because Quo Vadis is a soap opera drenched in religious and historical-epic motif: some Roman commander, Marcus Vinicius (Robert Taylor), meets and falls in love, star-crossed style, with Lygia (Deborah Kerr), in a picaresque and grossly obvious representation of “Rome” and “Christianity.” As a love story, Quo Vadis is fine: our main characters are roguish and illusory and therefore possess lots of qualities that we, as an audience, either possess or wish we possessed. The supporting cast is wildly one-dimensional, with Emperor Nero (Peter Ustinov) as a buffoonish caricature of the historical version of Nero, who was known for his mild schizophrenia and paranoia. Surprisingly, the performance is not cloying in a distracting way, and his place and position allow the character to take on a wider range of emotion and thought process. But Quo Vadis is still soapish at heart and the backdrop of Rome and Romanism is distracting because of its lack of specifics; Quo Vadis is framed by the whole of the Roman Empire, seen through a myopic lens of 4 years, with very little outside information about historical place or events. Who cares that this is Romanesque? It could have just as well been Babylonian or Greek or some version of Mesopotamia. The religious conflict is well noted, but again, who cares? This could very well have been a Jewish vs. Christian conflict or literally any other conflict. The point is that Quo Vadis just happens to exist and we’re supposed to honor it as an Oscar-worthy film? Through this muck, Quo Vadis is still a love story, and through hegemonic practice, Americans still want to see the protagonists succeed. In Quo Vadis, they do survive, though it takes three hours to get from point A to point B, which is too long for a love story and too short for a worthwhile documentary or historical epic. I stopped caring about any of the action and re-action in this film and instead focused on what made it Oscar-worthy, because, you know, blog, and here’s what it is: Historical adaptations were in vogue, Americans were (are) very, very Christian, and, although I’d like to argue that 1951 was a weak year for film, that’s just not true. But the reason it didn’t win was a combination of a lot of factors: lazy historical interpretation, length-story ratio and boring acting boiled down to a point and this point has transcended contemporary behavior: pandering to the audience. An American In Paris earned its Best Picture nod in 1951, albeit during an unfortunate sequence of Oscar-years. Preceded by All About Eve, which is a lasting highlight in Oscar’s catalogue, lumped with A Streetcar Named Desire, which has garnered more attention throughout the years and overshadowed by Singin’ In The Rain, which is Gene Kelly’s most well-known work. An American In Paris might have earned its Best Picture for a number of reasons (most likely because it fit the year the best), but an argument could exist that just lumps the other nominees (Decision Before Dawn, A Place In The Sun) as pandering and that Tennessee Williams just wasn’t representative of Hollywood in 1951. Who knows.